SAN DIEGO, Nov. 29, 2017 /PRNewswire/ -- Matson, Inc. (NYSE: MATX), a leading U.S. carrier in the Pacific, today announced the start of production on two new combination container and roll-on/roll-off ("Con-Ro") vessels for its Hawaii fleet that are scheduled for delivery in the fourth quarter of 2019 and second quarter of 2020, respectively. After a small ceremony at General Dynamics NASSCO's shipyard in San Diego, the cutting of steel plates began, initiating the construction work to build both ships. Matson is calling these vessels the "Kanaloa Class" in honor of the ocean deity revered in the native Hawaiian culture and will name each of the new vessels after predecessor ships from its 135-year history. The first vessel will be named Lurline, the sixth Matson vessel to carry that name, while the second vessel will be its fifth named Matsonia. The Kanaloa Class vessels are being built on a 3,500 TEU vessel platform, which is 870 feet long, 114 feet wide (beam), with a deep draft of 38 feet and enclosed garage space for up to 800 vehicles or breakbulk cargo. In addition, the new vessels will have state-of-the-art green technology features, including a fuel efficient hull design, environmentally safe double hull fuel tanks, fresh water ballast systems and dual-fuel engines, meaning that they will be able to operate at speeds up to 23 knots on either conventional fuel oils or liquefied natural gas ("LNG") with some adaptation for LNG. These advancements are important to Hawaii as a means to reduce fuel consumption, and will result in significant emissions reductions over time. "Construction of these new ships underscores Matson's commitment to serve Hawaii with the largest, most reliable and environmentally friendly vessels for the long-term," said Ron Forest, President. "The Kanaloa Class is designed specifically to meet Hawaii's freight demands while reducing our environmental impact and improving our efficiency for decades to come." General Dynamics NASSCO, a wholly owned subsidiary of General Dynamics is a leading U.S. shipyard constructing vessels for the U.S. military and for commercial operation in the Jones Act market. Statements in this news release that are not historical facts are "forward-looking statements," within the meaning of the Private Securities Litigation Reform Act of 1995, including without limitation those statements regarding vessel delivery dates. These statements involve a number of risks and uncertainties that could cause actual results to differ materially from those contemplated by the relevant forward‑looking statement, including but not limited to risks and uncertainties relating to the occurrence of any event, change or other circumstances that could give rise to the termination of the agreement for the Kanaloa Class vessel construction; the ability of the shipyard to construct and deliver the Kanaloa Class vessels on the contemplated timeframes; regional, national and international economic conditions; changes in general economic and/or industry‑specific conditions; the impact of future and pending legislation, including environmental legislation; government regulations and investigations; repeal, substantial amendment or waiver of the Jones Act or its application, or our failure to maintain our status as a United States citizen under the Jones Act; and the occurrence of marine accidents, poor weather or natural disasters. These forward-looking statements are not guarantees of future performance. This release should be read in conjunction with our Annual Report on Form 10-K and our other filings with the SEC through the date of this release, which identify important factors that could affect the forward-looking statements in this release. We do not undertake any obligation to update our forward-looking statements. 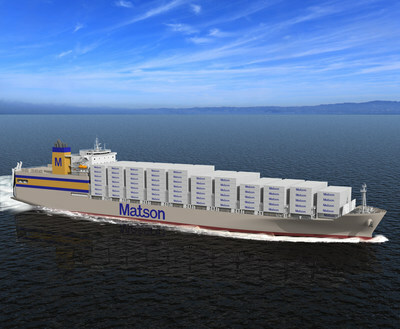 Founded in 1882, Matson (NYSE: MATX) is a leading U.S. carrier in the Pacific. Matson provides a vital lifeline to the economies of Hawaii, Alaska, Guam, Micronesia and select South Pacific islands, and operates a premium, expedited service from China to Southern California. The Company's fleet of 22 owned vessels and five chartered vessels includes containerships, combination container and roll-on/roll-off ships and custom-designed barges. Matson Logistics, established in 1987, extends the geographic reach of Matson's transportation network throughout the continental U.S. Its integrated, asset-light logistics services include rail intermodal, highway brokerage, warehousing, and less-than-container load freight consolidation and forwarding to Alaska. Additional information about the Company is available at www.matson.com.